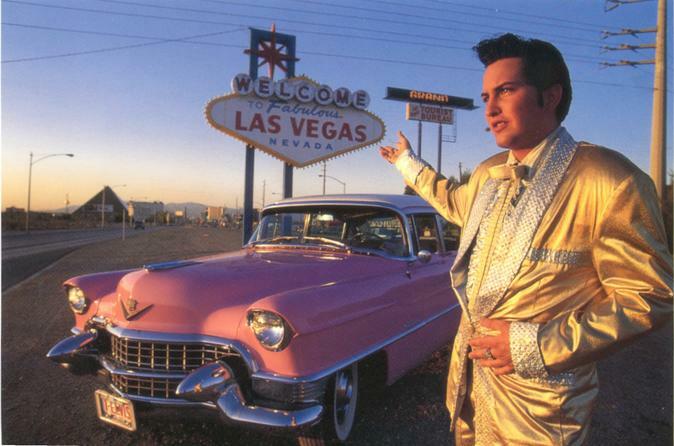 See Las Vegas with the King himself, Elvis Presley, on this private, 1-hour tour in a pink Cadillac. Who better to show off Sin City than the 'Official Elvis of Las Vegas,' Jesse Garon. Tour in a historic pink Cadillac convertible, once owned by legendary comedian Lucille Ball. This photo tour stops at up to three iconic strip locations, including the 'Welcome to Fabulous Las Vegas' sign. Become mesmerized at the amazing sights, exciting sounds, dancing water, and glittering lights that the fabulous City Las Vegas is known for. Put on some blue suede shoes for a 1-hour photo tour of Las Vegas with the King himself, Elvis Presley. Imagine riding in a pink Cadillac with Elvis himself at the wheel. And who better to show off Sin City than the 'Official Elvis of Las Vegas,' Jesse Garon. The tour begins with pickup by Elvis in a 1955 pink Cadillac convertible, once owned by legendary comedian Lucille Ball. Then be transported to three iconic Las Vegas attractions, including the popular 'Welcome to Fabulous Las Vegas' sign. Afterwards, get a hotel drop-off to conclude the tour. Become mesmerized at the amazing sights, exciting sounds, dancing water, and glittering lights that fabulous Sin City is known for. Included are stops at the world-famous 'Welcome to Fabulous Las Vegas' sign and two other iconic strip locations. If wanting to be married in a chapel wedding, but still want romantic photos at another iconic location, this tour is perfect. Seeing the sights of the Las Vegas Strip is truly a memorable addition to any wedding, family reunion, bachelorette party, first timers to Las Vegas, or the ultimate Elvis fan. The tour Includes a minimum of 100 photos taken by an accompanying professional photographer. Photos will be posted to a secure website for 7-to-10 days to select one 8x10 and six 4x6 photos of choice. These Las Vegas photo memories of Elvis and Sin City in the back of that pink Cadillac will last a lifetime. Up to five guests can enjoy this unique, private tour.